According to the Mopar super-gurus at Allpar.com, Chrysler Group engineers are fiddling with the idea of fitting a Pentastar V6 into the compact Dodge Dart and considering the complaints from both consumers and the media alike – a power yet efficient V6 could be exactly what the Dart needs to better compete in the segment. The new Dodge Dart is an awesome car with a smooth ride, great handling, tons of room and among the most impressive list of interior amenities available in the compact sedan segment but many people – both in the consumer world and in the media – have complained about the engine lineup. The Dart is available with the 2.0L Tigershark, the 2.4L Tigershark and the 1.4L MultiAir Turbo 4-cylinder engine with the most powerful being the 2.4L Tigershark and the most efficient being the 1.4L turbo motor. Chrysler made the move for 2014 to make the 2.4L engine the standard mill in most of the Dart trimlines which would suggest that consumers want more power before they want the great fuel economy of the 1.4L turbo motor but that 2.4L engine delivers “only” 184 horsepower and 171lb-ft of torque while the vastly more efficient 1.4L engine offers a very comparable 160 horsepower and 184lb-ft of torque. The 2.4L Tigershark engine should help quite a bit in offering more power to more Dodge Dart buyers after the 2.4L engine was only offered in the 2013 Dart GT while the balmy 2.0L mill was standard across all other trimlines shy of the GT and the Aero. However, the 2.4L doesn’t offer all that much power and in the Dart, which is a very large vehicle for the compact sedan segment, that engine still might not be enough to silence the critics. On the other hand, the Pentastar V6 engine could offer significantly more power with the output of the 3.6L Pentastar motor ranging from 283 to 305 horsepower depending on the application but at what cost? With fuel economy being a major concern of most compact sedan buyers, we have to question how the Pentastar V6 would impact the MPG capabilities of the sporty little Dart. The 2.4L Tigershark engine in the Dart offers 23mpg in the city and 33mpg on the highway while the 3.6L Pentastar V6 offers 19mpg in the city and 31 on the highway in the much larger and much heavier Dodge Charger SXT with an 8-speed automatic transmission. Were Chrysler to wedge that big Pentastar V6 into the engine bay of the Dodge Dart, it would comfortably offer the most power in the segment and based on the Charger fuel economy numbers, the Dart could possibly offer nearly the same fuel economy as the current Dart with the 2.4L Tigershark. Even with the same output as the Dodge Avenger of 283 horsepower, the Pentastar powered Dart would be much more powerful than any Dart before it while also offering what would likely be very similar fuel economy to the current 2.4L engine. The other downside to packing the powerful Pentastar engine into the Dodge Dart would be in the handling department. The Pentastar V6 weighs more than the 2.4L Tigershark engine and that added weight over the front wheels would almost certainly have a negative impact on handling but with the size of the Dart being so near that of the Avenger – there is a good chance that the Chrysler engineers could tweak the chassis and suspension of the V6 Dart so that it handled almost as well as those Darts packing the smaller, lighter engine. In other words, the Pentastar V6-powered Dodge Dart would offer considerably more power, very similar (if not better) fuel economy and very similar handling properties to the current engine lineup so adding Pentastar technology to the Dart could be just what the C segment Dodge needs to push sales figures closer to that of competitors from around the industry. 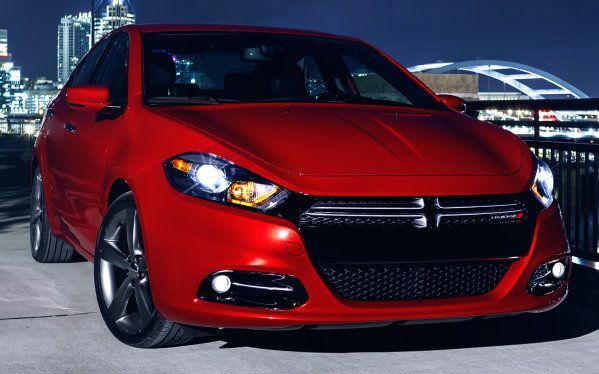 Given the fact that the Avenger isn't really competitive, this would help the upper-trim Darts serve as Dodge's midsize sedan.